*Do take note that I visited this city 2 years ago. There may be new cafes or changes that I am unaware of, so please feel free to let me know down in the comments or to my email if there are any changes to be made in this guide. Located within the allies, Amrita Garden may be a little tricky to look for after sundown. However, once you are there all will be worth it. This quaint little cafe serves organic and Vegan food with produce that is sourced locally. Prices may be higher compared to other cafes in Chiang Mai, but it's because they are serving organic products. My friends and I sat on the upper deck with minimal light (it was nightfall while we were there). With help from our phone's torchlight and the table candles, we were able to get a few shots of the food but these photos do not do justice to how they taste. Their burgers were delicious but the pasta was a little salty for my liking but nothing to the extreme with it being overloaded with salt. Overall, still worth a visit if you want something else other than Thai food during your trip. Need your fix for burritos or salsa chips? The guys at Ole Gourmet has got your back! This is another highly reviewed cafe in Chiang Mai, just opposite the road from 'Street Pizza and The Wine Houzz' mentioned in Part 1 of my guide. This place is not Vegan or Vegetarian but they have tons of options. Simply tell the staff that you want your food to be Veganized - easy peasy! Their burrito has quite a good serving size and would be best recommend to share with someone if you are on a food trail that day. Ole Gourmet is also kinda your cheaper alternative to Guzman Y Gomez. Just take note of the opening hours (as below) to avoid being faced with disappointment if you are there early for lunch. They only open at 2pm everyday. Many people actually flocked to this store back in 2016 but I am not too sure about it now. 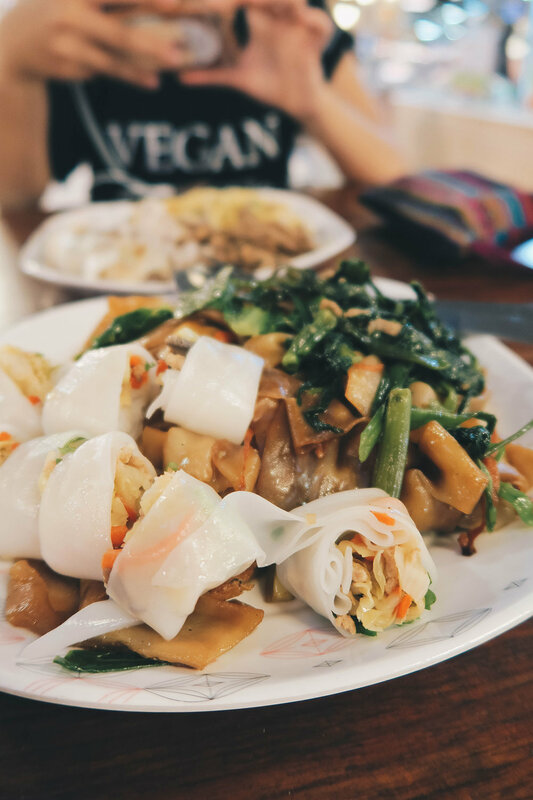 There was this crazy obsession among the community over the steamed spring rolls (and I was unashamedly one of those people obsessed with it!). Because of the Thai Fruit Fest back then, the owner of this stall would prepare most of the dishes without oil and lesser salt to suit the festival goers taste buds. Good choice for a healthy and affordable meal. My favourite dishes were the kang kong, kway teow and of course, steamed spring rolls. It is also rather convenient to stay in this area because there is a supermarket in the basement of the mall, so you can always come by here to grab your necessities. My roommate and I chanced upon this initially when our Songthaew (red cab) driver dropped us off at the wrong destination. There was this man sitting outside the store, giving us the thumbs up and prompting us to step into the shop. And we were glad we did just that. Pun Pun is rather far-off from the main city (the square above where 'The Phae Gate' is on the perimeters) but still worth a visit if you are willing to travel there. It is behind 'Wak Suan Dok' temple so you may get a little lost when trying to find this restaurant because you have to walk deep in from the temple gates. Also, they close before dinner, so do ensure to check the time before you are heading down. As the name suggests, they serve organic food at an inexpensive price. Food is beyond words (in a good way), however service can be slow especially when there is a huge crowd. I loved the Pineapple Curry with a side of naan - despite the name and combination, this place actually made the taste of both blend well together. 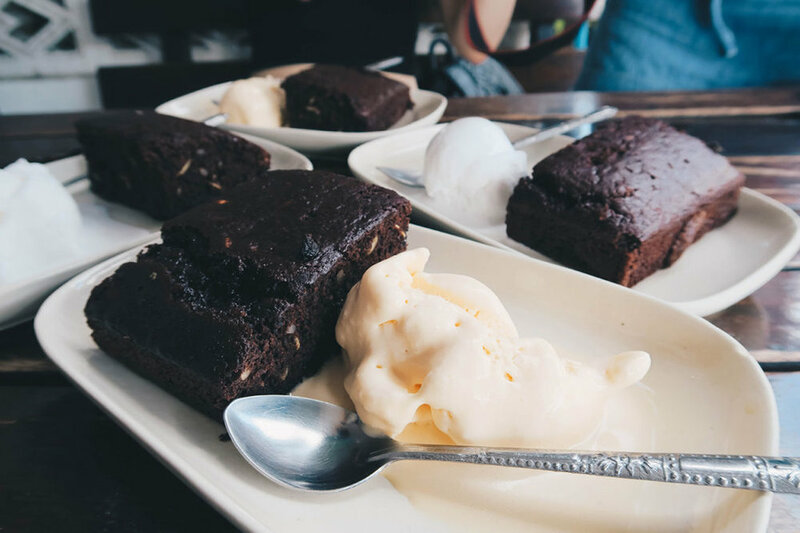 Check out 'Ice Love You' which is walking distance from Pun Pun, where they serve Vegan Ice Cream. To be frank, my friends and I only came here for the brownie which I highly recommend. They serve homemade ice cream for this dessert - you can choose between vanilla and coconut. The brownies are baked to perfection; chocolate-y and dense! Great place for big groups to hang out and dine at. And that concludes the last of all the cafes I recommend in Chiang Mai. It is a beautiful city full of culture and historic sites that I would love to return to again one day. Let me know which are your favourites if you have been there and if there are any cafes that are highly recommended which I left out. Hopefully, I will get to travel to Ubud soon and document my travels here!